Standing outside Garry’s garage at 6 o’clock in the morning, the horizon just starting to lighten over the rooftops of Parnell’s houses, I was pondering the journey the Club embarked on over a year ago when it decided to make a serious and ultimately successful attempt to earn the right to host this years event. The sound of Garry’s garage door opening interrupted me from my thoughts. A short time later I was waiting on the side of the road in one of Garry’s 300 SL Roadsters (lucky me!!) when the early morning serenity was shattered by the screams and howls like that of an unimagined beast crawling from its lair into the crisp morning air – it was Garry and his unimaginably fabulous 540K nosing out of his garage. The 540K’s supercharger was doing its best to wake not only the neighbours but also the dead. It was then off to Ellerslie in convoy, and so began the start of a long and satisfying day. On arrival at Ellerslie it was clear that we were by no means the first to get there. Already volunteers were manning gates and delivering cars, others were shuttling drivers back and forth so as to pick up and deliver more cars for our 30 car display. With a loose plan in place we got down to the task of placing cars in their designated spots, only to move some of them again as the plan was rejigged several times. More volunteers arrived, as did Hein with the trailer and marquee, so it was then ‘all hands’ to erect the marquee, tables and chairs. Our Club was participating in the club display competition, this years theme being “The Collectables”. Our take on this theme was to have a scale model of our real display on a table. Barb designed and made a model of our marquee and various members brought along scale models of their cars to display. 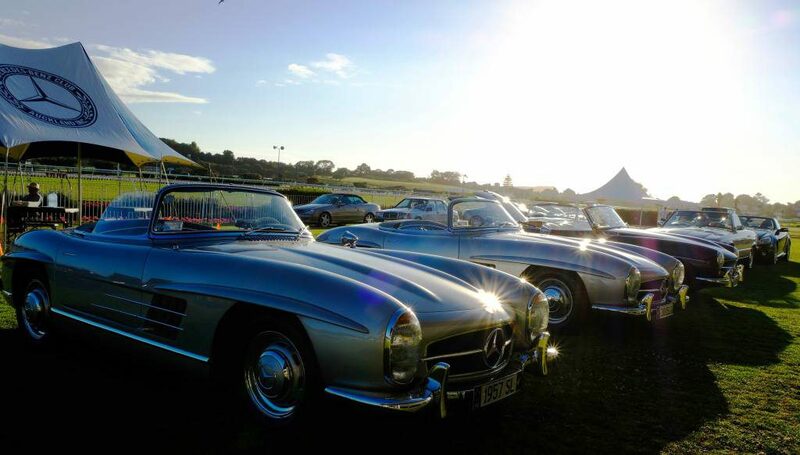 Elsewhere in the grounds Club members Colin Carran and Wayne Marmont were undertaking some nervous last minute cleaning of their Mercedes, a 1960 190SL and a 1964 230SL respectively. 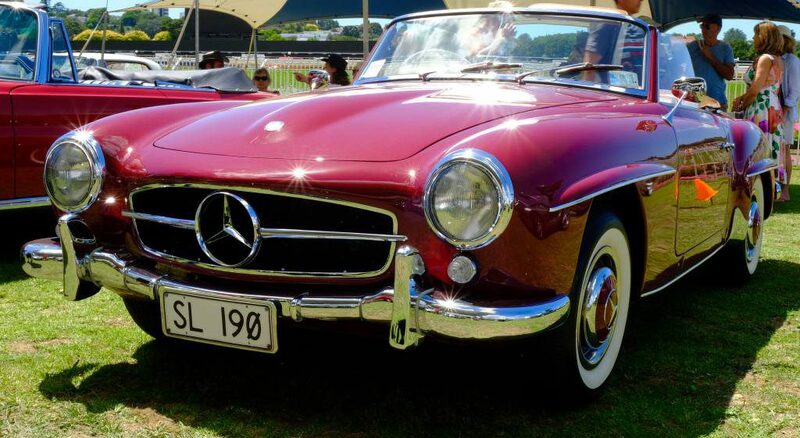 These two fabulous Mercedes made up the Club’s entry into this years Concours Teams judged competition. It was the start of a long and nervous day for them both. Meanwhile back at the Club display the ‘show stopper’ cars had arrived and were now in position. 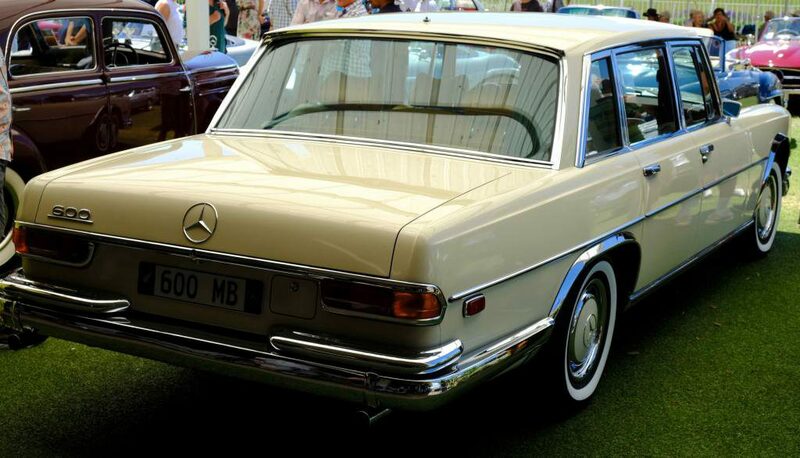 In pride of place were the six previous Mercedes-Benz concours winning cars all of which had achieved the magical 550 plus points out of 590. 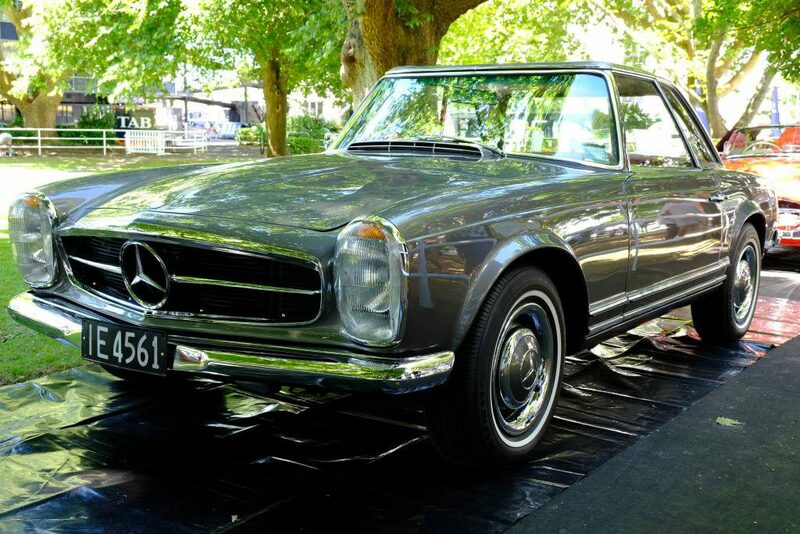 These six, in no particular order, were: a 1961 W121 190SL(deep red), a 1968 W113 280 SL, 1963 W111 220SE cabriolet, a ’60 W121 190SL (blue) and the two ’57 W198 300SL Roadsters. 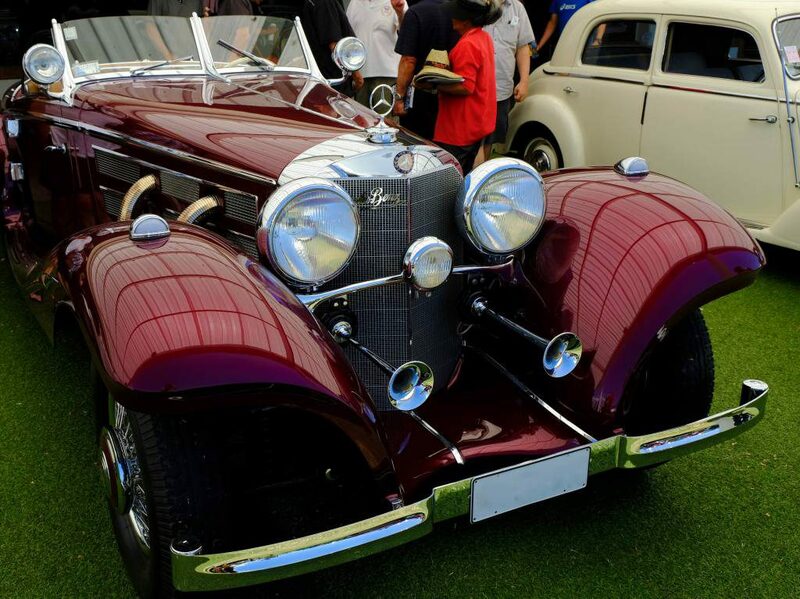 Some other standouts to me were: the ’38 540K, a ’28 SSK reconstruction, a 600 limousine, a ’69 300SEL 6.3, a ’78 450SEL 6.9, a ’53 220 sedan (I’d never seen one before) and the much more modern 2012 CLK 63 AMG Black. I’m sure we all had our favourites though! So we were all set, all we needed now was the admiring public. 10 am and gate opening time! There were already queues of people waiting to pay their money and enter. More volunteers had arrived and others had finished their pre-opening tasks and all were now on hand to handle cash and cards, hand out programmes and generally keep a steady orderly flow through the turnstiles. And boy was it busy! The public poured through the turnstiles with their cash and cash and cash, and their cards and cards and cards, and the swiping and swiping and swiping, and the programmes handed out and handed out and handed out. In no time there were hundreds of people making their way around the club displays and it didn’t seem to ease until mid afternoon. The weather was gorgeous and plenty of people were taking advantage of the shady trees for impromptu picnics. It was a great sight to behold. As our Club volunteers finished their shifts they headed down to the Club marquee where lunch was provided and many stories were swapped about how their morning had gone. There was tremendous interest from the public in our display and it proved time consuming trying to take photos of our display cars without crowds of people surrounding them. This was especially true of the fabulous 540, a car which left many of them awestruck. The afternoon rolled on under blue skies and a hot sun. Soon it was 3.15 pm – prize-giving time. As mentioned previously the club had entered two competitions this year, “The Collectables” club display competition and the Concours Teams competition. In the former we came a creditable 6th and in the latter Colin’s car amassed 493 points and Wayne’s 527 for a total team score of 1020 out of a possible 1180 and fourth place, just 4 points off second place! A great effort by them both, especially considering the relatively short notice they were given and the fact that it was the first event of this kind for Colin and only the second for Wayne. I know Wayne has the concours bug already but I suspect that Colin has now been bitten by the same bug. On behalf of everyone in the Club thanks to both of you for representing us and the marque so well, but not so well that you won as we would have had to do this all over again next year. But seriously, thanks Colin and Wayne. With prize-giving over and the public all but disappeared it was packing up time. Off home went the cars and down came the marquee, chairs and table were collapsed, the trailer was loaded and pretty soon there was nothing left to show except the smiles on the peoples faces as they reflected on a successful and enjoyable day. Garry invited everyone back to his place for a post-show party, so those that could headed to Parnell for celebratory drinks and pizzas, most of us relishing the chance to sit down and rest our weary feet. Having reluctantly rolled out of bed at 4.30 that morning it was a relief to collapse back into it at 10.30 that night hoping that I wouldn’t be awakened by the screams and howls of an unimaginable beast crawling from its lair somewhere far off in the distance the next morning…. Thanks to “The Godfather” Garry for setting us off on this challenging journey more than a year ago. 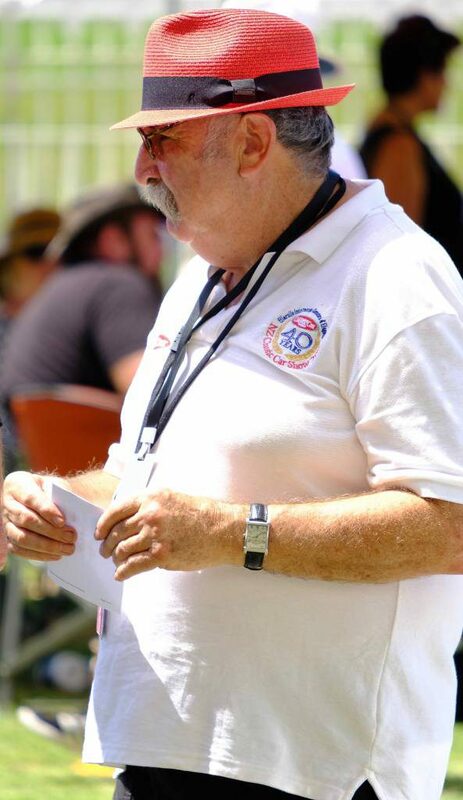 Thanks to Garry, David, Barb and Brian who comprised the Intermarque hosting sub committee on behalf of Mercedes-Benz Club Auckland, and who no doubt spent much of the actual day on the phone or ‘putting out fires’ to ensure the event went so smoothly. Thanks to the Mustang and Porsche clubs for providing experienced volunteers. Thanks to the Intermarque committee for their valued advice and guidance. But really the biggest thanks goes to all the volunteers without whom we would not have been able to man the event. 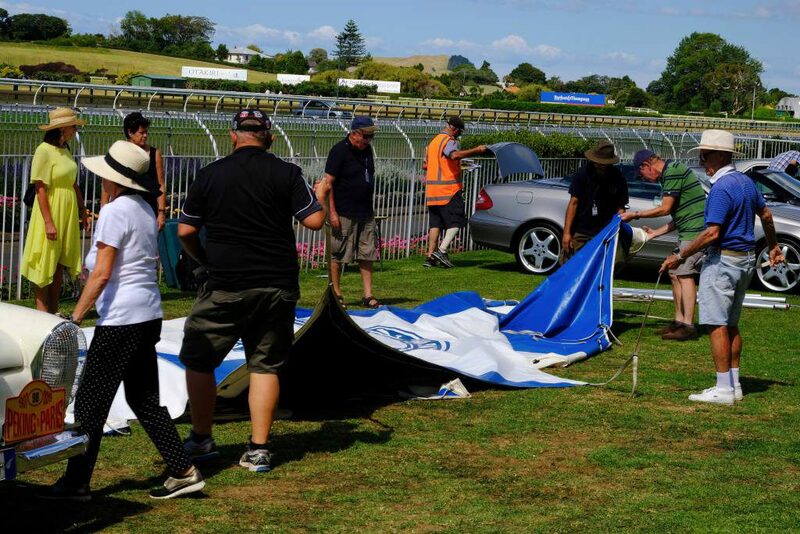 So if you directed traffic, brought a car, parked a car, put up the marquee, picked up cones, counted cash, swiped a card, handed out programmes, stamped a hand, collected cash or welcomed the public…. THANK YOU!